Megs pulls Jordan in a wagon several hours after the surgery. I’m amazed and blessed to be sitting here with our little man fast asleep next to me. Just looking at him and thinking of what he’s been through in the last 20 months causes my heart to seep with gratitude. Though we’ve hit some little bumps along the way God has blessed us with many more blessings than we could ask for. Last week we were faced with our first surgery for Jordan since his back closure and the insertion of a vp shunt in his little head to drain extra fluid from his brain. 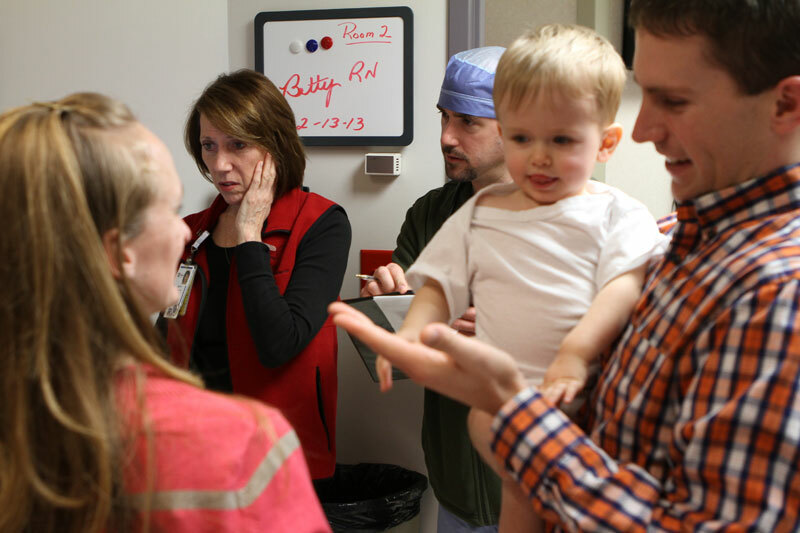 After our visit with Dr. Anton Milo (Jordan’s ear, nose and throat doctor), he suggested removing Jordan’s adenoid and placing tubes in his sweet little ears. I felt several emotions while anticipating the surgery. I was excited to decrease a chance for ear infections that cause fevers, which can lead to other seizures, and anxious because surgery is surgery is surgery. I was so thankful to hear from the nurses that he could eat around 4:15 a.m. the morning of surgery. So we woke up early for his favorite little breakfast, which was just enough to have him fall back asleep until it was time to get up to get ready to head over to Akron Children’s Hospital at 9:30 a.m.
Outside of the admitting office, we met our pastor and his wife for a brief chat and a pray before starting our day. I can’t tell you what a comfort it is to know we have people out there who lifted our family up in prayer even for a minor surgery. The morning seemed to move right along and on schedule as each professional met us in the preoperative area. I was amazed at how many individuals it takes to care for our delicate children. Jordan, of course, took everything in stride. However, the effects of interrupted sleep were starting to creep up on him – along with wanting to be able to get down and explore. We often find ourselves in a pickle because of his current state of not walking independently. So we found activities as we were in our holding state – including 52-card pick-up, thanks to Jordan’s personal picker upper (AKA Daddy). Each of our team members greeted us with warm reassuring smiles as they gathered the information needed to prepare for the procedure. They ranged from preop nurses, surgical nurses, child life specialist, nurse anesthetist student, anesthesiologist, and a doctor. Prior to the surgery we asked Dr. Milo to pray with us for the procedure. 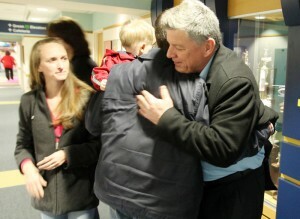 It was a comfort knowing Jordan was going to be with a great surgeon and our Great Physician. As the surgical team took Jordan from our arms and carried him down the hall, he looked at us with those sweet eyes and said, “MMOmm! !” My heart about broke in two. Randy reminded me to step back inside the room because he was going to be ok and it would be harder if he saw me standing there. I kept thinking, poor little mister doesn’t know what’s going on and we are out here and he’s in there. We later found out that he was his typical ham bone self in the operating room as he sat on the bed cracking himself up. I’m not sure we were even settled in the waiting room when our names were called to meet Dr. Milo in the consultation room. 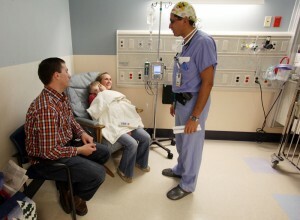 He said the procedure went well and gave us instructions for how to care for him at home. Dr. Milo then led us into the recovery room. As we walked back, Randy paused for a brief second. He experienced a flood of emotions as we passed the area our little Peanut had been after his back surgery. It had been a difficult time for him. He was with our little man without me being there because I was still recovering from my C-section from the day prior at Akron General Hospital. We found our little man being rocked in a blanket by his recovery nurse Holly. It was such a sweet sight to see him being held instead of lying in a crib. As Jordan’s face continued to turn a faint color of red and his nose continued to be white, we were reassured that this was all part of the anesthesia. 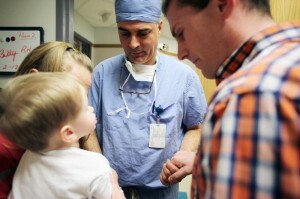 Dr. Milo and the anesthesiologist Dr. Farid came to check on the little man and answer our questions. 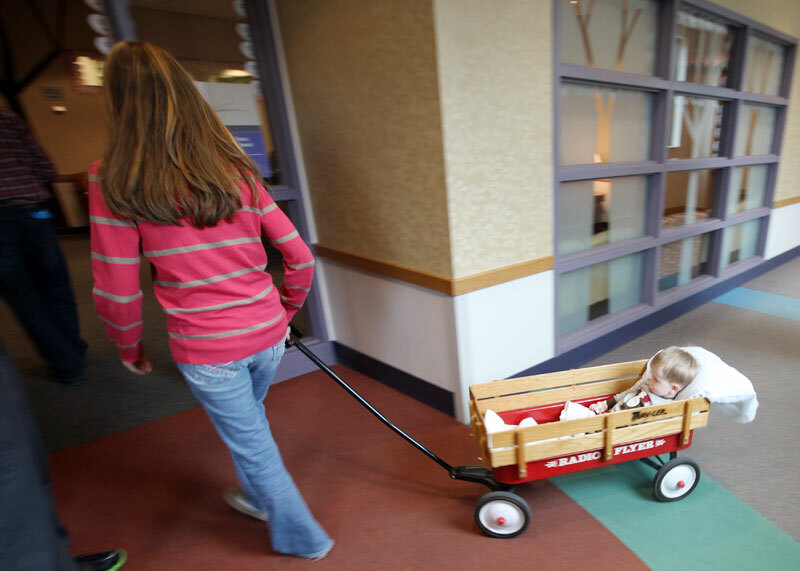 When we were ready to be released, we were given the option to let Jordan ride in style in a Radio Flyer wagon to Dr. Milo’s office for fitted earplugs. The day was a success and we look forward to a 95% chance of not getting ear infections for a while. We are so thankful to the team at Akron Children’s Hospital for treating Jordan like he was their own. And we thank our Heavenly Father for never leaving his side, especially when we needed to.